I cannot quit. I just can’t. I am unable to stop making hammers and mallets lately. A friend salvaged some cherry runners off a pallet where he works and gave me one of the pieces. I felt pretty good about these. In a couple of hours, I was able to make something useful with this wood instead of it going into the trash. This entry was posted on July 6, 2010 at 2:50 am and is filed under Carving, Hammers, Leather working, Tool Making, Woodworking. You can follow any responses to this entry through the RSS 2.0 feed. You can leave a response, or trackback from your own site. I really like the design of your mallets. They look beautiful. 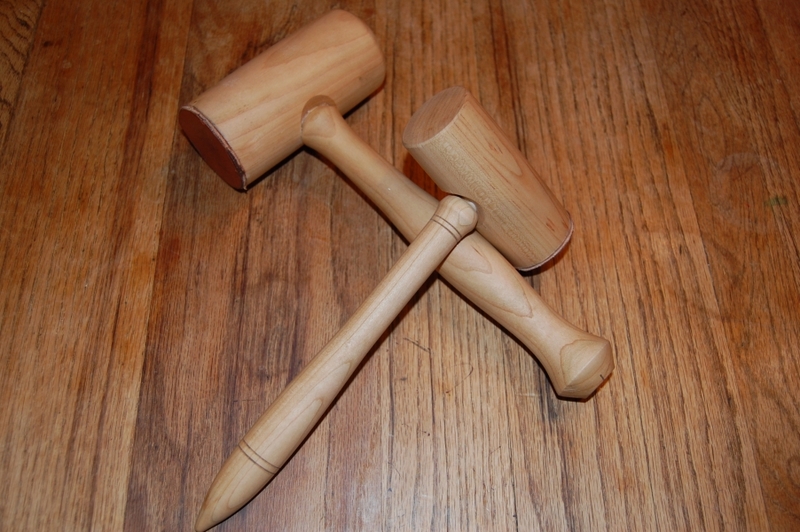 Would you be interested in making a customized mallet to tap a Liberty Bell replica? Let me know.